A dog found swimming more than 220 kilometers off the coast of Thailand has been returned safely to land. Late last week, workers on an oil rig noticed the animal, all alone, in the water. It began swimming toward the side of the structure. The dog was able to get itself onto a solid area. He appeared cold, tired and fearful. The workers lowered a rope and secured it around the dog. Then, they worked together to pull the animal up to safety. The crew that found the dog quickly gave their new friend a name: Boonrod. The name means something similar to “survivor” in the Thai language. One of those workers was Vitisak Payalaw. He has been providing updates on Boonrod on his Facebook page. He said it was lucky that the crew noticed the dog in the water. If there had been waves, he said, the animal likely would not have been seen. No one knows how Boonrod ended up all alone at sea, or how long he had been out there. But Vitisak and others have suggested the animal might have fallen off a fishing boat. On Monday, Boonrod arrived on dry land. A team of animal doctors was waiting for him in the southern Thai province of Songkhla. Workers at the Songkhla port also welcomed the dog with neck rubs and a special “welcome” necklace made of yellow flowers. Many people took pictures with Boonrod. The dog is now in the care of an animal doctor in Songkhla. The animal protection group Watchdog Thailand said he is in good condition and getting stronger. On Tuesday, the group published pictures of Boonrod getting washed -- and getting plenty of love and attention. Vitisak says that if no one claims Boonrod as their pet, he will take him with him to his home in northeast Thailand. 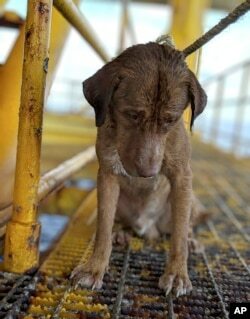 In this Friday, April 12, 2019, photo, a dog sits on an oil rig after being rescued in the Gulf of Thailand. The dog found swimming more than 220 kilometers (135 miles) from shore by an oil rig crew in the Gulf of Thailand was returned safely to land.